Sharp-shinned Hawk or a Cooper’s Hawk? This is one of the hardest ID’s to make. Most novice birders will simply write it off a “Shooper”, not really sure which one it is. But here are some tips that can help you make the right ID and join the ranks of elite birders. When you hear the term “Accipiter” in North America, it can only be one of three possible species, although in other countries there are many other members of this genus. In North America it could be a Northern Goshawk, a Sharp-shinned Hawk or a Cooper’s Hawk. These hawks can be distinguished from other hawks by their long, rudder-like tails and short-rounded wings. They are not made for soaring, but for short bursts of powered flight. This gives them a distinct flight style that is described as “flap-flap-glide”-two or three (or sometimes more) quick flaps followed by a short glide, and then it starts again. Northern Goshawks are the rarest and largest of the three. The breed in the far north, and they don’t come too far south in the wintertime. Since they are the bulkiest and largest, they are usually a little easier to distinguish from the Cooper’s Hawk and the Sharp-shinned Hawk. If you’re in an area where the Cooper’s Hawk and the Sharp-shinned Hawk ranges overlap, or if you’re near a migration area where both species come through in large numbers, this identification challenge might come up often as their field markings are strikingly similar. Many birders will tell you that Cooper’s Hawks are larger than Sharp-shinned Hawks, and this is true, but it’s really hard to tell them apart based on size alone as a very small male Cooper’s Hawk will be really similar in size to a large female Sharp-shinned Hawk. Instead, take the following tips into account. 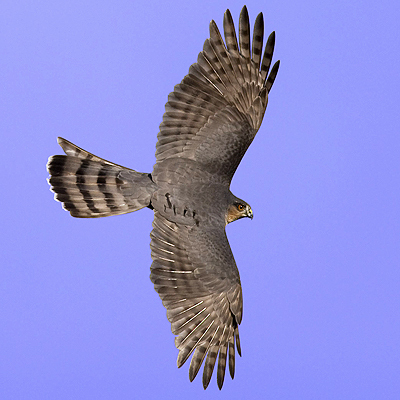 Because of their small size, Sharp-shinned Hawks have to work harder to stay aloft in flight. This means they have more flaps per glide. While a Cooper’s Hawk might do three flaps before a glide, (“flap flap flap glide”), a Sharp-shinned Hawk usually has to do four or more. Sharp-shinned Hawks also have a weaker flap than Cooper’s Hawks. A Sharpy almost looks like it is snapping its wrists, while a Cooper’s Hawk has a more solid down stroke that involves more of the wing. 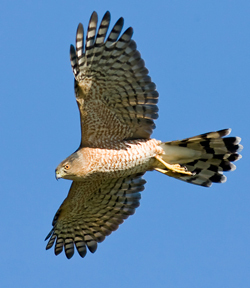 Cooper’s Hawks have larger heads than Sharp-shinned Hawks, and they project further out. This gives the Cooper’s Hawk a cross-like shape, while Sharp-shinned Hawks have more of a “T” shape. Finally, Cooper’s Hawks have a rounded tail, while Sharp-shinned Hawks have a squared off tail. It’s a lot to keep track of, but practice makes perfect! Go to a hawk migration site with an experienced birder and work with him or her to try to get this identification right. Use as many clues as you can-flight pattern, overall shape and field marks all combine together to help you get the correct ID.